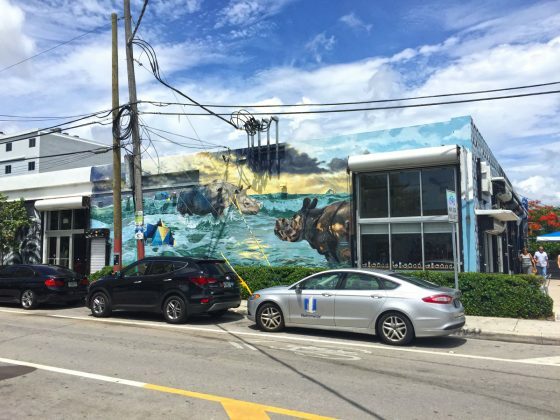 The tour, hosted by friendly, knowledgeable tour guide Gina Natoli, is a 2 ½ hour leisurely walking tour through blocks and blocks of murals by world class artists, while filling eyes and palates with some of the best eats around. 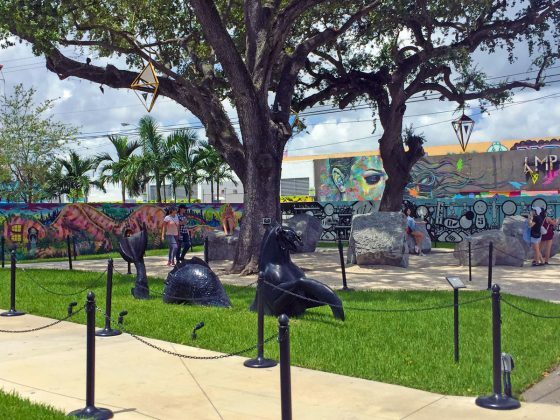 The obvious main attraction to the relatively new Wynwood neighborhood is the blocks and blocks of murals by world class artists. But a great hood demands great eats, and the Wynwood Food Tour delivers with a 2 ½ hour leisurely walking tour that gives the background of the place while filling eyes and palates with some of the best eats around. Wynwood doesn’t have a distinct ethnic identity, so the food choices range from Latin to Italian to Kosher. The tour group of about 10 people from as far away as the Netherlands meets at ground zero – in front of the iron gates entrance to Wynwood Walls, the first place to stake the art flag. I bring along an old friend, Jordan, who I went to college with and we moved to Miami together, lured by a new oceanfront frontier where we both got jobs writing about the arts and watched Miami go from a glam but dangerous city to a shining arts metropolis with vibrant neighborhoods. 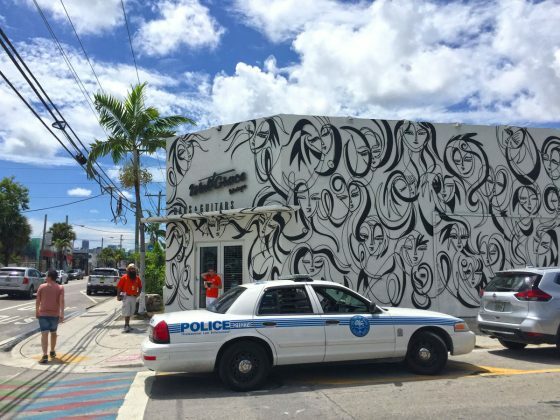 Wynwood Walls Founder Tony Goldman once said “Artists are the shock troops of gentrification” and he waged full scale war on making the former warehouses bold and beautiful. 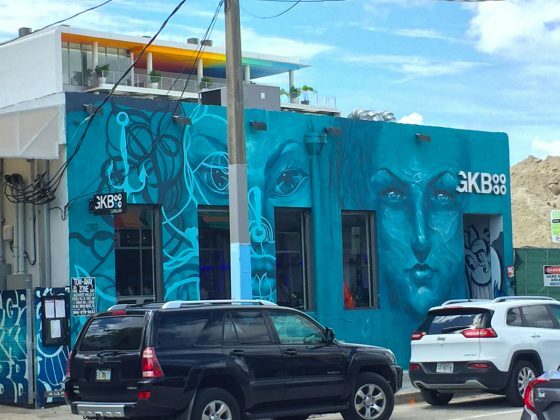 He succeeded, and the mainstay restaurant Wynwood Kitchen & Bar is gorgeous and artsy with soaring high ceilings and an interior décor by Shepard Fairey along with other artist paintings in the main dining room. 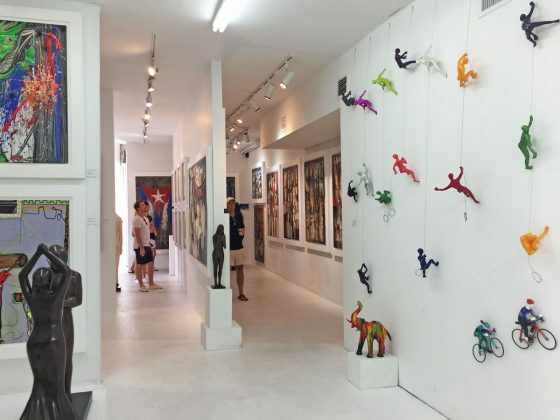 There is a cool loungey bar and a large outdoor patio area that overlooks the huge murals in the first courtyard by Kenny Scharf, Shepard Fairey and Futura. Our friendly knowledgeable tour guide Gina Natoli, originally from New Yawk with the heavy accent to prove it, seats us at a long marble table and immediately a delightful plate with 3 appetizers is brought out along with a glass of frosty IPA beer. The food is heavy on Latin flavors with some nice crispy sweet fried plantains, a gooey warm cheese croquette and a beef empanada with a cilantro jalapeno sauce for dipping. Tasty with a complex mix of flavors, the art and delicious bites get the tour started off right. Walking out through the courtyard Gina gives a little more background on the murals of David Choe – who made $200 million overnight for mural he did at the Facebook offices. 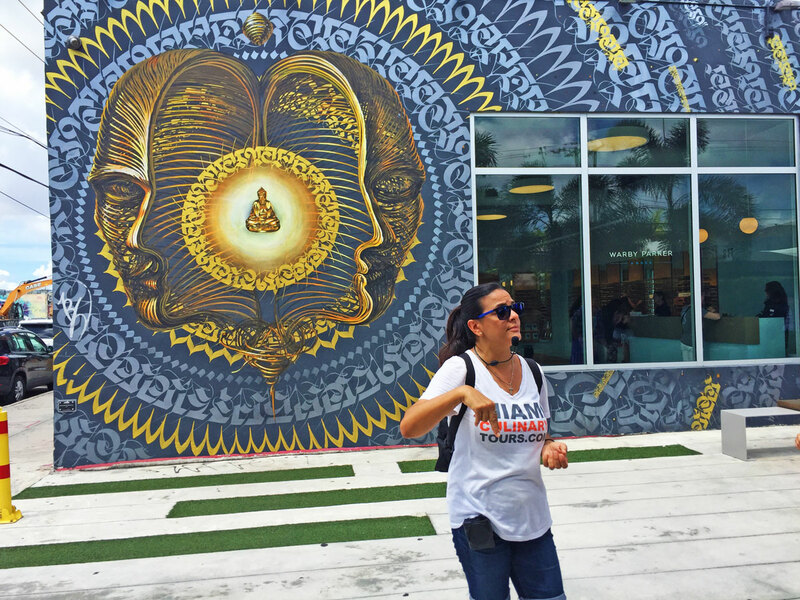 We walk through the flower festooned gates and head out to the streets as Gina points out the stenciled art and messages on the very ground beneath our feet. 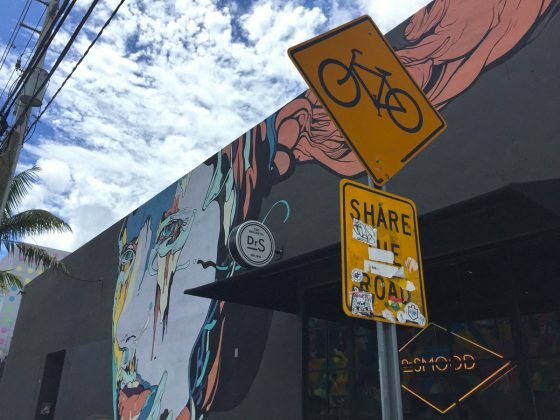 There are also “slaps” stickers by artists everywhere – quick art that gets the spot tagged in an instant. GK Bistronomie Restaurant is our next stop, a chic bistro with a distinct suburban industrial décor all sleek gray and glass and silvery metal. 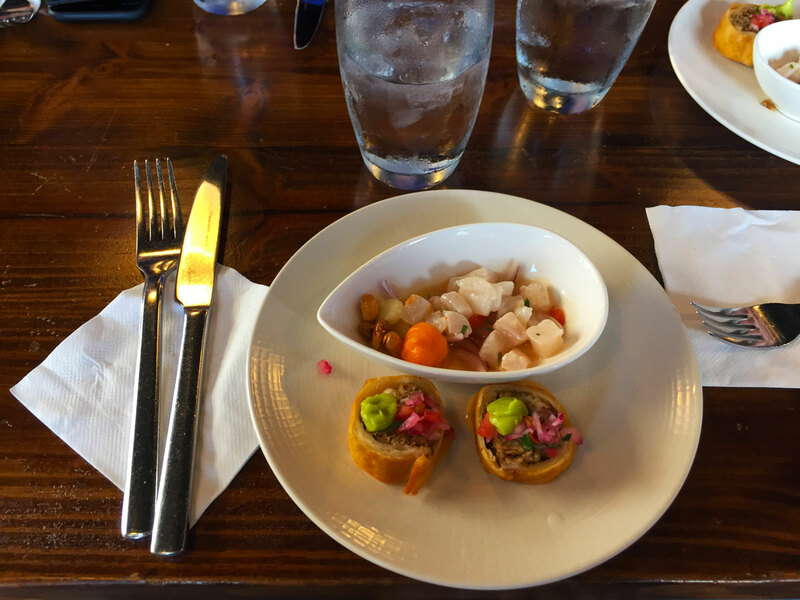 At a high top bar we are served some tangy ceviche and a pork version of an empanada. The ceviche is marinated fish in a “tigers milk” broth, heavy on vinegar and lime juice, red onion, corn kernels both toasted and boiled, and a squeeze of sweet potato puree. The pork empanada is topped with a red onion salsa and cilantro puree. Sliced like a sushi roll, the little bite packed a flavorful punch. Walking back out into the searing late summer sun, Gina pointed out the murals that were everywhere you turned, down a long alley, on fences, and on the entire sides of buildings as in the case of a large red, gold and white mural by the LA artist Retna, a series of mysterious hieroglyphic like symbols that spell out a love letter to the neighborhood. Retna is the artist who recently commanded half a million dollars for his mural on the façade of the new Restoration Hardware store in West Palm Beach. Refreshment was on our minds as we strolled into Dr. Smood Organic Café, a juicery with hip ambiance and wall of tea jars. 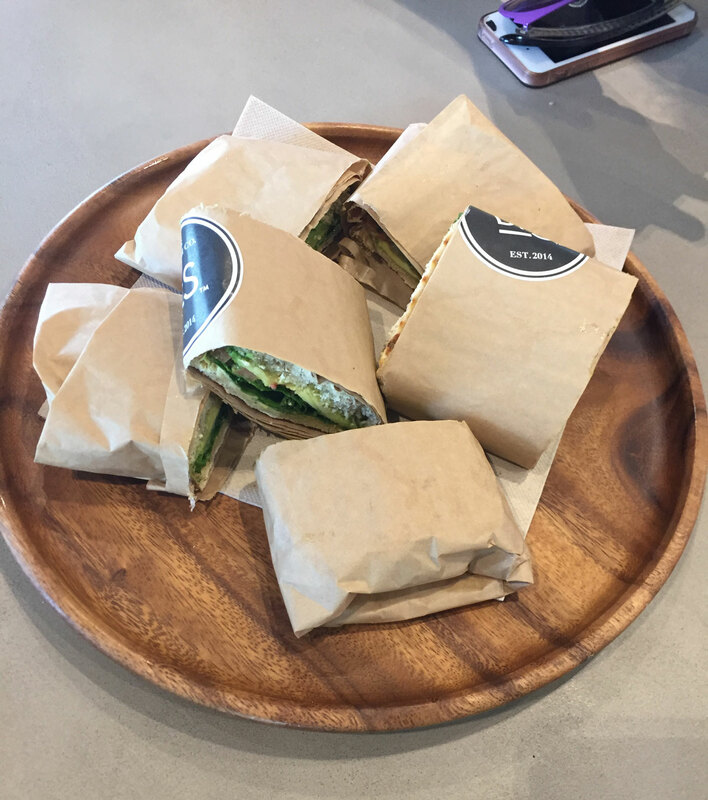 They offer raw, vegan, dairy and gluten free juices and foodstuffs. We tried some of the cold press juices with pineapple and turmeric, tangy and sweet and a little bit spicy, the juice went down like a cool breeze. 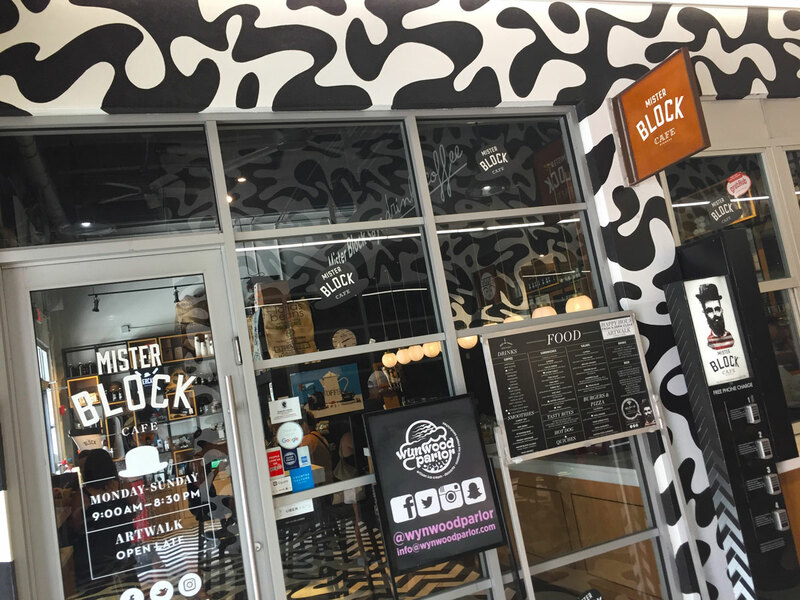 The group proceeded on across the street to the Mister Block Café, a hotspot coffee shop in a mini-mall plaza painted with eye popping black and white patterns. You can dine inside at the tables, in the plaza tunnel at couches or tables or in the back patio, an option that was bit too hot midday. While we were there, Gina brought out a laminated binder with photos explaining the various styles of graffiti and their trippy names. 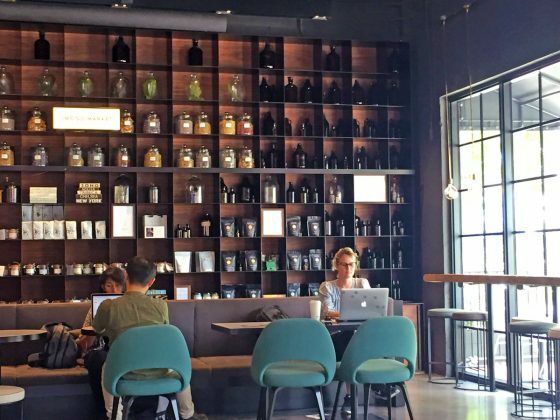 There’s the “Blockbuster” – that’s when letters are huge and take up the whole breadth and width of a wall. 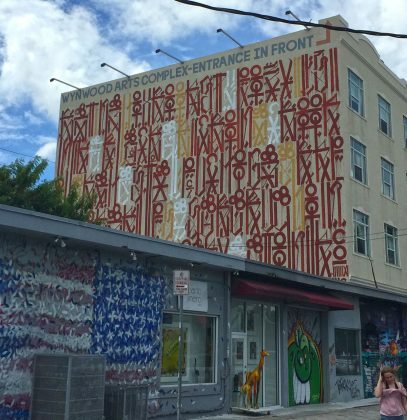 “Heaven” is when the artist makes his way to the very top of a building and paints his message way up high, usually by dropping down from the roof. “Bubble” is the big fat letters that look like overblown up balloons. “Wild Style” is a sophisticated scratchy, sharp edged jumble of letters, originated in the Bronx and made famous by the 1983 movie of the same name. Our last stop was a real delight and a home grown success story. 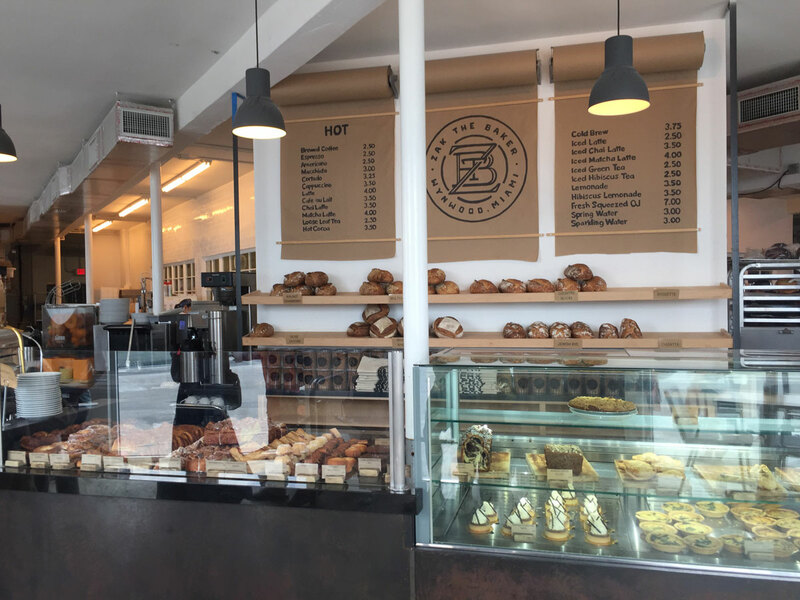 Zak the Baker was founded as a kickstarter project by Zak Stern, which became so popular he now has a huge corner bakery with certified-kosher seal of approval. Zak is waiting for us at the counter with a box full of kosher rice flour cookies bursting with fudgey goodness and dusted with sea salt. These are some serious sweets. Zak wears simple work boots with his jeans, flour-dusted apron and khaki cap like the ones local Jews wear on the northern Israeli farms where he worked while learning to make his beloved artisanal bread. 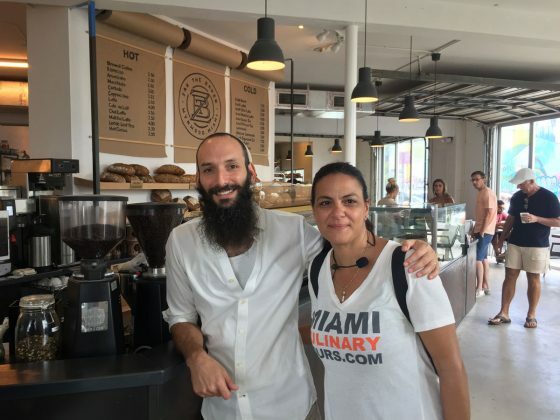 He poses for pictures as the lines grow longer for his cakes, breads, quiches, pastries and coffee. He personally makes me and Jordan iced cappuccinos as we nosh on the cookies, getting a caffeine chocolate sugar rush. 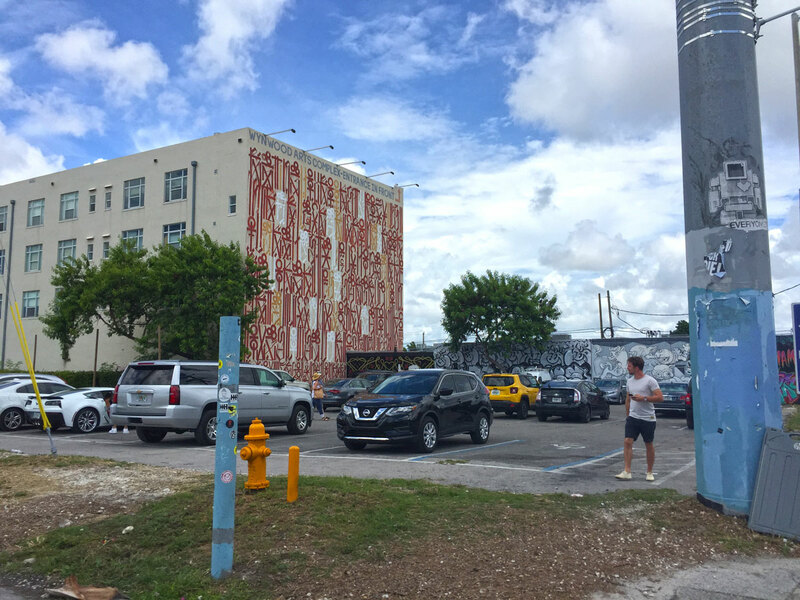 Sitting at the counter, we notice a large garage going up on the next block, a mixed use structure with retail and parking being built to accommodate the cars that stream into Wynwood year round. The fringe of the hood still feels gritty, with leftover warehouses that still stock imported shoes, but it’s changing fast and loud and colorfully. The shock troops have done their duty. Planning to join the tour? 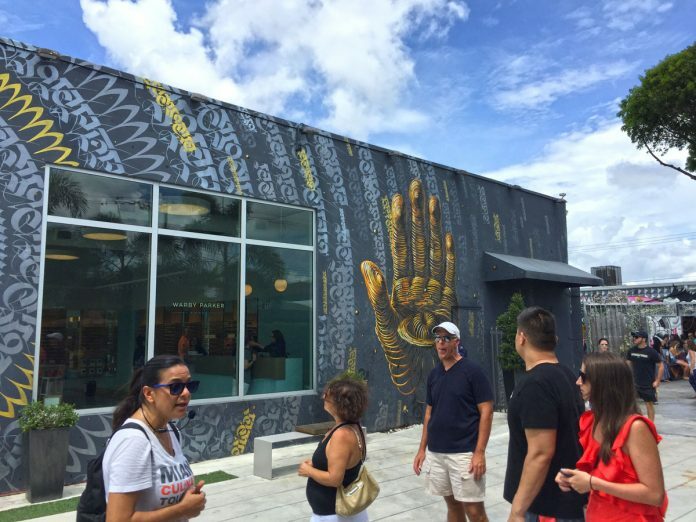 (786) 942-8856 or visit www.miamiculinarytours.com/tour/wynwood-food-tour for prices, tour dates, and more information. 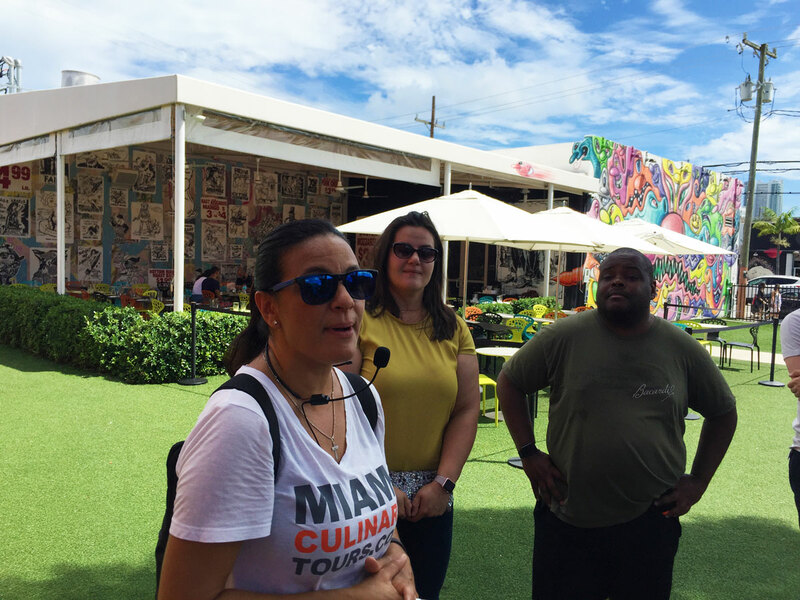 Review of the Wynwood Food Tour, a top rated attraction in Miami, meandering through murals, cafes, and art galleries in popular Wynwood Art District.